Beautiful and soft, very happy with this rug, nice and comfortable to play on with the grand babies! A chic update of mid-century modern style, this 8' x 10' rug from Safavieh's Retro Collection evokes 1960s flair. The perfect complement to clean-lined furniture, this rug features an abstract motif in a neutral color palette of grey, ivory, and black. 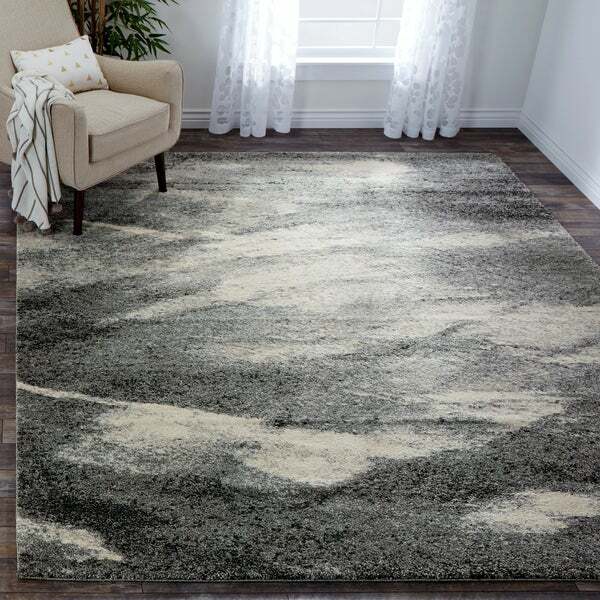 This plush rug features a design resembling free-form wide chalk colored brush strokes on a charcoal colored backdrop. Its unsystematic design easily adds visual intrigue to any space with its Art Deco inspired style. I love this rug! It is modern and ties together my gray and wooden living room perfectly. It is soft but the pile is thin so it doesn't shed and the colors look like they will withstand wear and tear from my guests. 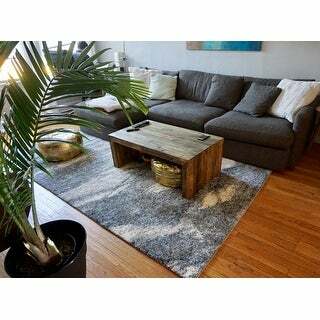 I bought this rug for a high-tragic area - our living room. I'd previously had a wool rug and it shed like nobodies business - especially when our chihuahua would roll around on it. This rug has been down for three weeks and not a single fiber has shed - and the dog is as feisty as ever! 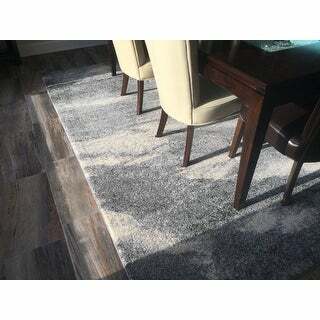 The color is also really great for us because the light and ark grey patters have an interwoven beige and cream as well - and the beige is nice to help hide minor accidents and spills if we get to them quickly - another feature our previous rug didn't offer. Lastly, the rug FEELS great. Not remotely scratchy and it's very soft - especially with the rug pad we placed underneath. Looks and feel are pretty luxe. Great value - so happy with it! Ths item came within just a few short days and excellently wrapped ( corners and all). By the picture online it is very hard to actually see the true pattern and beauty of this rug. 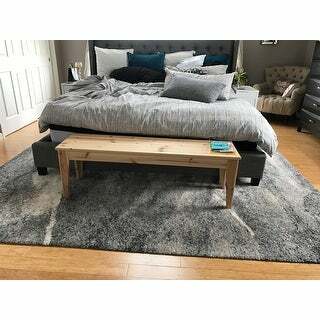 If you are looking for a rug to compliment cream/ beige as well as grey and black furniture and walls, this is perfect. There is a random ("patchy/swirly") pattern that would work with tradional as well as contemporary furnishings. . It is very soft and comfy underfoot.. Only wish it would have been offered in an even larger size than 8 x 10. The price was good for such a large and beautiful carpet. Highly recommend. We've had this rug for a couple months now and I am so happy with it. My husband hates walking around on tile so we were looking for something that would be soft and have some cushion, but didn't want to spend hundreds and hundreds of dollars. This was a great value for the price - especially considering the size of the rug. It's very comfortable to walk and sit on. 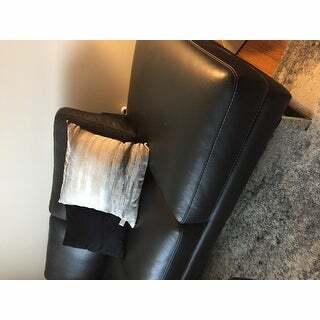 It would probably feel very plush with a rug pad underneath but we do not have one and are still happy with the quality. We have a limited amount of furniture on it and it stays in place well on the tile. I am very practical and one of the things I liked in other reviews was that it would hide dirt well, because it's in a high traffic area of the house. As soon as I laid it out I knew what people meant. 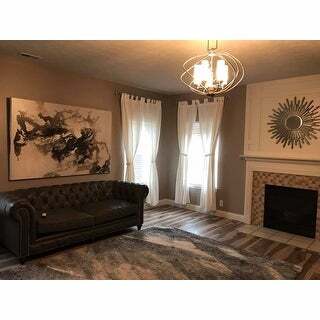 It's also a unique style that can match many wall colors, so I don't need to replace it if I repaint the room, and I don't envision it going out of style any time soon. Cleans easily and looks great. I would buy this rug again! Couldn't be happier with it. Like the colors and designs on the rug. 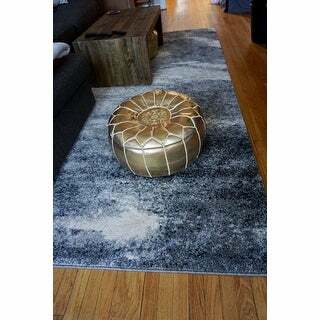 I recently purchased the Safavieh Retro Modern Abstract Grey/ Ivory Rug which was delivered promptly. My family and I love this rug and am 100% satisfied with our purchase. The rug is a very good quality rug. I rug is plush to the touch and we do not feel the need to purchase padding for the rug. 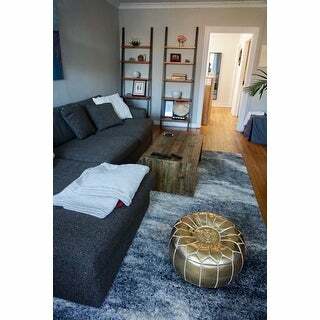 The Safavieh Retro Modern Abstract Grey/ Ivory Rug fits in perfectly with our decor. The perfect dining room rug for my mid-century modern dining room set. Luxuriously soft. The colors are true with a muted blend of blacks, grays and whites. The perfect neutral palette for pops of color. I chose red. Safavieh consistently offers well made and affordably priced rugs for any decor. I have them in almost every room of the house. We bought this rug to give the room an added dimension and it doesn't disappoint. It has notes of cream and black with a mix of different shades of gray. We are playing with a couple of textures in the room but it blends in well. It laid flat within the first 24 hours of placing it in the room. This is a beautiful, nice quality rug. The edges are nicely finished and it feels great under foot without a pad; soft and plush. The colors are as pictured and it lends a modern feel to a room. When delivered it was very securely wrapped. I left it wrapped for months before I opened it. It laid out perfectly flat within minutes. There was no odor either. Great purchase. We love this addition to our dining room. We needed the ivory and gray bc of our floor color and it compliments it nicely. The 8x10 is large enough to keep rug under chairs tucked in or out. Vacuums nicely bc it's not shaggy but soft touch to feet. Love it. Beautiful, thick carpet, very comfortable. Reasonably priced and good looking! I have had this rug in my living room for ove five years and I continue to get compliments on it. 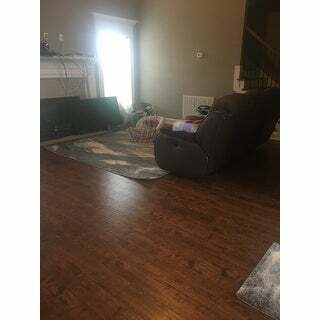 I have friends who were skeptical when they saw it in my new house before furniture arrived.....but they totally loved it once the room was furnished. I recently looked for a larger size but could not find it or I would buy it now. Love this rug more than the matching runner! Soft, not as thick/plush as I would like it but I’m buying a 1/2” cushion to go under it and it’ll be perfect. My fiancé came home and sat on it and next thing I knew he was snoring and I had to get the kids fed and put to bed before I got him up. So I give the comfort level a 10/10. I give it 5 stars completely! Very beautiful, easy to clean. I ordered two and both have more of gray and beige tones. "Dies this rug allows regular vacuum cleaning ? This is not like shag type, right?" The rug is not a shag and vacuums up beautifully. I bought three different sizes and love the quality and soft feel of this rug. "Does this rug has more warm cream colors or the "nuLOOM contemporary granite mist shades grey rug"?" I don't own both, but judging from the pictures, I would say this rug has more warm cream colors than the contemporary granite mist shades grey rug. We absolutely love it. We actually have more than one because our room is more of an "L" shape. It is the perfect mix of the warm cream colors and grey. I compliments our dark hardwood floors excellently, and ties our modern/contemporary style room together perfectly. Hope this helps. "I recently had a negative experience with online colors. I ordered a patio door panel that was described as having a background of "ivory" with a "grey" pattern and a different website that described the same product as having a "beige" background with a "grey" pattern. They arrived and were a deep beige, almost khaki and the grey pattern looked taupe. In both photos, the panel looked white with grey. So, now I am concerned about this beautiful area rug. It looks like a variegated shades of grey with white interspersed throughout. The description says that it is ivory. I would be okay with ivory if it is truly ivory. One review referred to it as "cream". I just do not want beige. Ivory leaning toward white would be fine. Is that what this is or is the ivory leaning toward beige?" I was looking for a neutral gray colored rug to put in my lake house, and blend in with the other colors there. 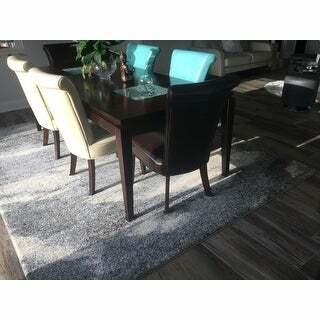 I ordered the Safavieh Retro abstract grey/ivory rug in both the 8'x10 and the long runner, as well as a 4x6 rug. It truly is grey, with a mix of light grey and medium grey, with little spots of black, and white, which could be called cream or ivory. Beautiful rugs, well made, and lay flat, and hides any dirt or dog hair. I did notice that this rug also comes in a beige color, but all my rugs are the grey. So make sure the rug says grey, not beige, as both colors are available. "Does this rug have a matching hall rug?" To my knowledge, it does not have a matching hall rug. But this rug is exactly as depicted in the online picture. It is really beautiful, and very soft and plush. However, if you will use a rubber pad, as opposed to a much thinner liner, you will find that it feels amazing. I couldn't be happier with this purchase. For the price, it more than delivers a beautiful product and effect. "Does this rug need a thick rug pad"
No, a regular pad will be just fine. NO , I LOVE THIS RUG. IT IS PLUSH AND ELEGANT. "What is the best type of vacuum for this rug? Upright, canister, ?" I have an upright. Works great on this rug. "I would like to use this as an office rug. Can you easily move a roller office chair on it?" I don't believe it will be easy to move about as the shag is 1/2 in long. No. It is a lovely area rug but you would want one of those office desk chair pads so chair would roll easier as it is quite plush. I have this rug in my office underneath my clients' chairs, which are not on rollers. So, I moved my chair over (it has rollers). It will move on the rug - it's not going to "glide" along like it does on wood or tile, but it moves fairly easily. The rug is really nice and looks great with the greys and creams in my office.